Some tots show interest in independent eating from an early age: they balk when parents try to feed them even the messiest of foods, grab at their parents’ utensils, and love mastering scooping — even if it means multiple outfit changes. Whether your child is one of those kids or a more timid eater, she’ll love the texture of Silispoons, and she’ll soon be on her way to proudly eating solid foods on her own. These dishwasher-safe spoons, which come two to a pack, feature a wide shovel head for scooping up food instead of the typical spoon shape, which often results in most of the food falling off in transit to their little mouths. The juicy looking colors add to the appeal of Silispoons, making mealtime a more pleasant sensory experience in multiple ways. 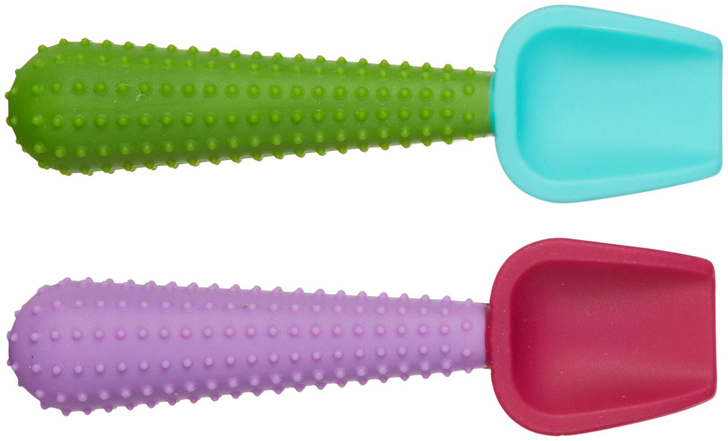 Silispoons are made from durable, BPA and phthalate-free silicone, so they should last through many mealtimes. If your child eventually does wear them out, you can send them back to Silikids to be recycled! Some tots show interest in independent eating from an early age: they balk when parents try to feed them even the messiest of foods, grab at their parents' utensils, and love mastering scooping -- even if it means multiple outfit changes. Whether your child is one of those kids or a more timid eater, she'll love the texture of Silispoons, and she'll soon be on her way to proudly eating solid foods on her own. These dishwasher-safe spoons, which come two to a pack, feature a wide shovel head for scooping up food instead of the typical spoon shape, which often results in most of the food falling off in transit to their little mouths. The juicy looking colors add to the appeal of Silispoons, making mealtime a more pleasant sensory experience in multiple ways. Silispoons are made from durable, BPA and phthalate-free silicone, so they should last through many mealtimes. If your child eventually does wear them out, you can send them back to Silikids to be recycled!